This Comprehensive Purchase Agreement is designed for the acquisition of a manufacturing plant by an investor lender, who will then lease the property back to the operator seller tenant. This sale leaseback transaction is essentially a financing transaction. The Purchase Agreement has extensive definitions for defined terms in the agreement, and contains elaborate Seller representations and warranties. 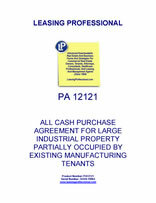 This form is a real estate purchase agreement for an all cash acquisition of an industrial property. The property has some manufacturing tenants who occupy a portion of the square footage of the property. The purchaser intends to occupy a substantial portion of the building area initially, then expand into the area occupied by the third party tenants as the purchaser's space needs increase and the third party leases expire. The purchaser has a specified inspection period during which it can conduct customary due diligence for the purchase. The purchaser is obligated to keep transaction information concerning the property and the purchase confidential, including so-called "evaluation materials" related to the purchase. 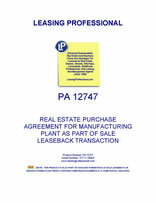 Several exhibits are included with this purchase agreement, including Earnest Money Escrow Instructions, a Documents List of materials concerning the property, an Estoppel Certificate for the Third Party Tenants in the Property, an Assignment and Assumption Agreement of Leases Agreement, an Assignment and Assumption of Intangibles Agreement, and a Bill of Sale for Personal Property.